Thanks to the members of the Monroe Fire Department for the many favorable emails we’ve received (Christmastime at the Monroe Fire Department). Yes, here is another picture of the Monroe Fire Department (1951) and there could be more to follow. Unfortunately, I cannot identify the firefighters in the Christmastime picture or in this picture. Hopefully, some members of our class can help with that. We can accept credit for the comments but not the photographs. Credit for these photographs of the MFD should go to Mr John Gulledge. The picture quality you refer to is due to John’s use of a “digital negative scanner” totally eliminating the paper process altogether (film to pixels). FOLLOW UP FROM NITA WALL: The names of the firemen are: "Dub" McClellan, ? 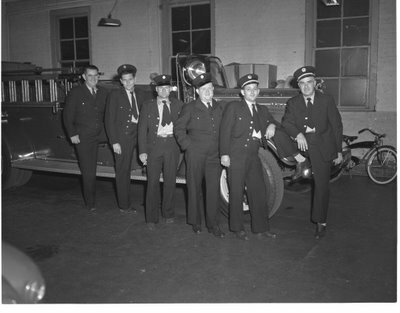 Griffin, Jim Broome, Randy Quick, Ralph Skinner and Chief Goodwin. Wonderful picture!! I hope some of the Goodwin family are seeing these pictures of the Fire Dept and can help with names...Thanks for sending these!